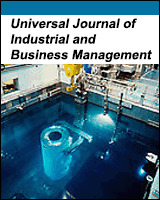 The Universal Journal of Marketing and Business Research (UJMBR) is an open access journal that publishes research analysis and inquiry into issues of importance to the business community. Articles in UJMBR examine emerging trends and concerns in the areas of general management, business law, public responsibility and ethics, marketing theory and applications, business finance and investment, general business research, business and economics education, production/operations management, organizational behavior and theory, strategic management policy, social issues and public policy, management organization, statistics and econometrics, personnel and industrial relations, technology and innovation, case studies, and management information systems. The goal of UJMBR is to broaden the knowledge of business professionals and academicians by promoting free access and provide valuable insight to business-related information, research and ideas. UJMBR is a monthly publication and all articles are peer-reviewed.